A new plan from some Tory MPs suggests ministers postpone Brexit until 23 May “to conclude negotiations”. It is being suggested as an alternative to cross-party proposals which would see MPs take control of the process. But Education Secretary Damian Hinds told the BBC delaying Brexit would only prolong uncertainty for business. 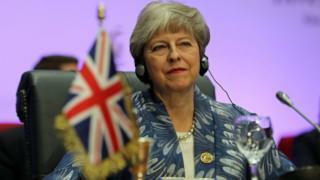 The prime minister is holding talks with EU leaders at a summit in Egypt, as she presses for more concessions to her deal. Mrs May announced on Sunday that MPs will get a fresh vote on her deal by 12 March, vowing that leaving as planned 17 days later was “within our grasp”. But many MPs had wanted another so-called “meaningful vote” sooner than that, and Labour leader Jeremy Corbyn suggested Mrs May was “running down the clock” until a time when MPs were forced “to choose between her bad deal and a disastrous no deal”. Mrs May’s announcement also provoked disappointment among business leaders, who are clamouring for certainty about what is to come. The prime minister had a “good, friendly” 45-minute meeting with German Chancellor Angela Merkel on the sidelines of the EU-League of Arab States summit in Sharm-el-Sheikh. A government official said they discussed Brexit, among other things, and the issue of extending Article 50 came up “fleetingly”. But they said Mrs May reiterated that the UK wanted to leave the EU with a deal on the scheduled date of 29 March. Mrs May is due to hold talks with other key European figures later, including European Commission president Jean-Claude Juncker. There will then be further talks in Brussels on Tuesday on the Northern Ireland backstop – the number one sticking point for many when it comes to the Brexit deal. The prime minister has long resisted any suggestion that the UK’s departure could be postponed beyond 29 March. But political editor Laura Kuenssberg says two cabinet ministers have told the BBC they believe she will this week grant some kind of concession to allow for a possible delay. Such a move, though, would inevitably anger Brexiteers who want the UK to leave as planned, whatever the cost. Monday: The PM meets with EU leaders, including Angela Merkel and Jean-Claude Junker, on the fringes of the EU-League of Arab States summit. Tuesday: Mrs May gives a statement to the House of Commons updating them on her progress on Brexit. Brexit Secretary Stephen Barclay and Attorney General Geoffrey Cox return to Brussels to continue talks with the EU. Wednesday: MPs debate an amendable motion tabled by the government. Speaker John Bercow chooses which amendments to put forward, and MPs vote on the next step proposals. On Wednesday, MPs will get another chance to put forward a range of amendments in the Commons to show what direction they want Brexit to take. One – drawn up by Labour’s Yvette Cooper and Conservative Oliver Letwin – would, if passed, give MPs the power to demand a delay to Brexit if a deal cannot be agreed by 13 March. Three cabinet ministers, Greg Clark, Amber Rudd and David Gauke, signalled they could be prepared to vote for it if there is no breakthrough in the next few days. Ms Cooper told the BBC that the move was not intended to stop Brexit as it would be up to the government, not Parliament, to determine the length of any delay. Ms Rudd told reporters on Monday morning that she was “completely committed” to making sure the UK leaves the EU and she supported the prime minister. There’s also the proposal of a new amendment from a group of Conservative backbenchers, led by Andrew Percy and Simon Hart, which calls for a “strictly time limited” delay to Brexit if there is no formal deal by 13 March. It would avoid handing control of Brexit to Parliament, and its proposers hope it will attract support from MPs who have indicated they might support the Cooper-Letwin amendment a “last resort” to avoid no-deal, as well as colleagues who are relaxed about no-deal, on the basis that it will provide more time for planning. Defence Minister Tobias Ellwood told BBC Radio 4’s Today programme he was “encouraging” the prime minister to announce a delay to prevent a no-deal Brexit. But Education Secretary Damian Hinds said a delay would “just prolong these issues”. Ready for the cunning wheeze? It’s absolutely plain that Theresa May doesn’t want to delay Brexit in any way. An extension, in her view, doesn’t solve any of the dilemmas. But she has also never actually 100% said that she would never, ever, ever end up doing that. Simply, she can’t, because Parliament might take the decision out of her hands, or the prospect of a defeat might force her to move. Labour is also likely to table an amendment on Wednesday, putting its own Brexit plan – one which backs a permanent customs union with the EU and a close relationship with its single market – to MPs. That move could take the party a step closer to supporting another EU referendum. Theresa May is continuing to push Brussels for extra legal promises that the backstop – the controversial policy that aims to prevent a hard border returning to the island of Ireland – would, if ever implemented, be temporary. UK proposals include “alternative arrangements”, seeking a time limit to the backstop or agreeing a way the UK can choose to leave it at any time. However, Irish Foreign Minister Simon Coveney warned on Sunday that the EU would not re-open the withdrawal agreement, adding his government could not be asked to “compromise on something as fundamental as the peace process”, on which the border played a key part. ← Oscars 2019: Which Oscars outfits have caused a stir?